Table Mountain is a flat-topped mountain forming a prominent landmark overlooking the city of Cape Town in South Africa. It is a significant tourist attraction, with many visitors using the cableway or hiking to the top. The mountain forms part of the Table Mountain National Park. 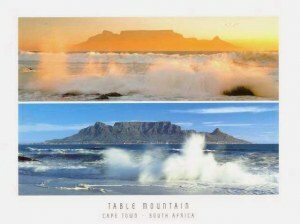 The main feature of Table Mountain is the level plateau approximately 3 kilometres (2 mi) from side to side, edged by impressive cliffs. The plateau, flanked by Devil's Peak to the east and by Lion's Head to the west, forms a dramatic backdrop to Cape Town.